Scientists with the Sloan Digital Sky Survey-III (SDSS) have created a new map of the Milky Way that provides the first clear evidence of migration of stars throughout our galaxy. The study, which determined that 30 percent of stars have traveled across the galaxy, is bringing a new understanding of how stars are formed and travel throughout the Milky Way. "We were able to measure the properties of nearly 70,000 stars in our galaxy for this particular study using the innovative SDSS infrared spectrograph," said Donald Schneider, Distinguished Professor of Astronomy and Astrophysics at Penn State and a coauthor of the study. "This exercise can be described as galactic archeology. These data reveal the locations, motions, and compositions of the stars, which provide insights into their formation and their history." Schneider is the SDSS-III survey coordinator and the project's scientific publications coordinator. "In our modern world, many people move far away from their birthplaces, sometimes halfway around the world," said Michael Hayden of New Mexico State University (NMSU), the lead author of the new study. "Now we're finding the same is true of stars in our galaxy. About 30 percent of the stars in our galaxy have traveled a long way from where they were born." The key to creating and interpreting this new map is measuring the elements in the atmosphere of each star. "From the chemical composition of a star, we can learn its ancestry and life history," Hayden said. 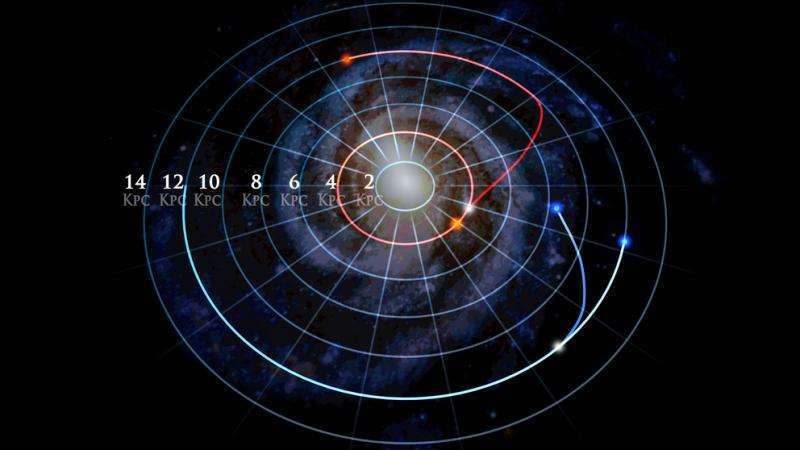 A single frame from an animation below shows how stellar orbits in the Milky Way can change. It shows two pairs of stars (marked as red and blue) in which each pair started in the same orbit, and then one star in the pair changed orbits. The star marked as red has completed its move into a new orbit, while the star marked in blue is still moving. The chemical information comes from spectra, detailed measurements of how much light the star gives off at different wavelengths. Spectra show prominent lines that correspond to elements and compounds. 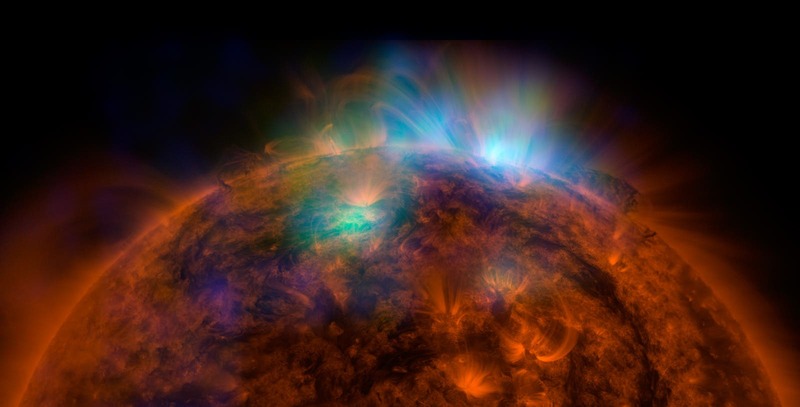 Reading the spectral lines of a star can tell astronomers the chemicals the star is made of. "Stellar spectra show us that the chemical makeup of our galaxy is constantly changing," said Jon Holtzman, an astronomer at NMSU who was involved in the study. "Stars create heavier elements in their cores, and when the stars die, those heavier elements go back into the gas from which the next stars form." As a result of this process of "chemical enrichment," each generation of stars has a higher percentage of heavier elements than the previous generation had. In some regions of the galaxy, star formation has proceeded more vigorously than in other regions — and in these more vigorous regions, more generations of new stars have formed. Thus, the average amount of heavier elements in stars varies among different parts of the galaxy. Astronomers then use the amount of heavy elements in a star to determine in what part of the galaxy the star was born. Hayden and colleagues used APOGEE data to map the relative amounts of 15 separate elements, including carbon, silicon, and iron, for stars all over the galaxy. What they found surprised them — up to 30 percent of stars had compositions indicating that they were formed in parts of the galaxy far from their current positions. "While on average the stars in the outer disk of the Milky Way have less heavy-element enrichment, there is a small fraction of stars in the outer disk that have heavier element abundances that are more typical of stars in the inner disk," said Jo Bovy of the Institute for Advanced Study and the University of Toronto, another member of the research team. When the team looked at the pattern of element abundances in detail, they found that much of the data could be explained by a model in which stars migrate radially, moving closer or farther from the galactic center with time. These random in-and-out motions are referred to as "migration," and likely are caused by irregularities in the galactic disk, such as the Milky Way's famous spiral arms. Evidence of stellar migration previously had been seen in stars near the Sun, but the new study is the first clear evidence that migration occurs throughout the galaxy. Future studies by astronomers using data from SDSS promise even more discoveries. "These latest results take advantage of only a small fraction of the available APOGEE data," said Steven Majewski, the Principal Investigator of APOGEE. "Once we unlock the full information content of APOGEE, we will understand the chemistry and shape of our galaxy much more clearly."